Our giant 4 tier snowman tower stands almost 2 1/2 feet high and makes a grand impression! 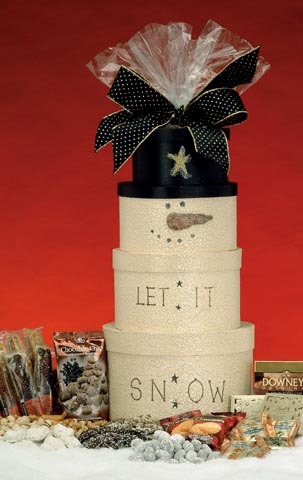 The crackled antique white boxes are dusted with a clear glitter finish and topped with a black “top hat” box. A grand assortment of delicious foods await you inside too! Contents: La Tempesta Gourmet Biscotti, Downey’s Lemon Vodka Cake, Dusted Chocolate almonds, Walker’s Scottish Shortbread, 2 boxes Lindt Chocolate Lindors, Ghirardelli Chocolates Squares, 3 bags of Belgian Chocolate Covered and Decorated Pretzels, Hunter Nut Mix, Whole Pistachios and Chocolate Chip Cookies. Net Wt. 3lbs.15oz.